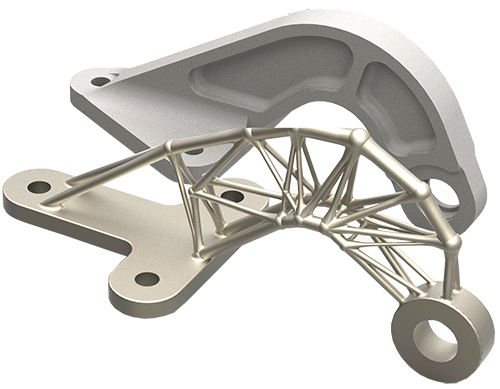 UK-based engineering software provider LimitState has launched its LimitState:Form software package, a conceptual design tool aimed at identifying new 3D-printed component designs that are often much lighter and more efficient than traditional forms. LimitState debuted the software at the UK’s Manufacturing Technology Centre, home of the Mercury National Additive Manufacturing Centre, at a meeting of the Innovate UK supported Anvil Project. LimitState:Form enables design engineers to generate high-fidelity optimized forms directly, while accelerating their optimization workflow. Use it to perform layout and geometry optimization in combination, and to directly manipulate the solution obtained. Rather than generating a mesh, as other software does, the software creates an optimized parametric geometry that can be inspected and edited directly using Ansys SpaceClaim. It also reports to the user just how close a solution is to the likely mathematical optimum, eliminating guesswork from the optimization process. In use at the advanced manufacturing research centre, the software has produced significantly more efficient component forms than previously developed. Shown in the photo is an air-brake hinge, manufactured for the Bloodhound supersonic car, before (top) and after optimization. “LimitState:Form generates consistent, repeatable results with no fudged parameters, and it’s easy to assess the lattice structures produced,” says Iain Todd, director, Mercury Centre, Sheffield, UK.